Last night (May 29) the stars turned out in full for NBC’s Healing in the Heartland: Relief Benefit Concert. A string of country entertainers performed for a sold-out crowd at Oklahoma City’s Chesapeake Energy Arena. Shelton is one of the many Oklahoma natives who appeared during the concert. Others include: Carrie Underwood, Garth Brooks, Reba McEntire, Ryan Tedder, Vince Gill and Toby Keith. The special featured performances by Darius Rucker, who sang “True Believers,” Luke Bryan, who entertained with “Crash My Party,” and Rascal Flatts’ performance of “I Won’t Let Go.” Miranda Lambert delivered an especially emotional moment with “The House That Built Me,” allowing the audience to take over the singing during one portion. 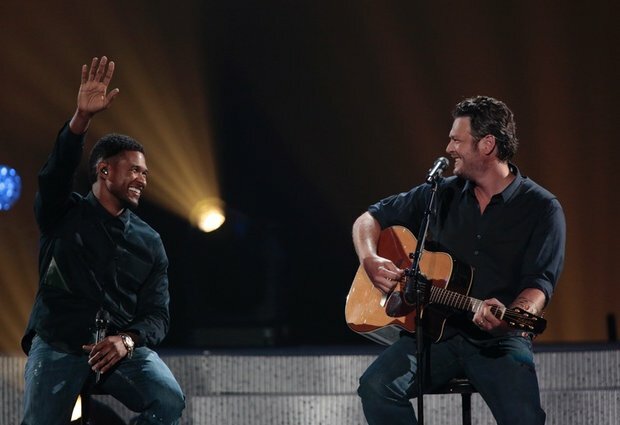 Gill delivered the ballad “Threaten Me With Heaven.” Shelton and his The Voice co-star Usher performed “Home,” a song recorded by both Shelton and Michael Buble. Television hosts Jay Leno and Jimmy Fallon, along with Alicia Keys and Underwood, recorded messages urging viewers to donate money for tornado victims. The one-hour concert on NBC attracted about 8.5 million viewers, placing first in its 9 PM/ET time slot. It earned a 1.9 adults 18-49 rating, the network’s best time period performance since Jan. 9, according to Nielsen and Zap2It.com.